We are doing something a little different, and quite fun. Simply put, this mobile prints site is where we put some our best iPhone photographs that we love and want to get out to art lovers at a great price. And most of these photographs are only offered here, not in our gallery – that’s part of the fun. You’ll find some interesting pieces that we absolutely love, and you can decide on the size and type of print yourself – metal, paper, canvas and more. Framed (in your choice of frames), unframed or just matted (in your choice of mat colors), it’s up to you. Buy them and have them shipped to your door. The quality is very good (we have tested them personally.) And it’s guaranteed. This is a perfect gift or just when you just want to get a nice piece for that special place in your home or office within a smaller budget. Personally we love the smaller print sizes between 8 to 12 inches for iPhone photographs. But you can get them larger if you want too – it’s your choice. Click on the link above or the images below to see our photographs. 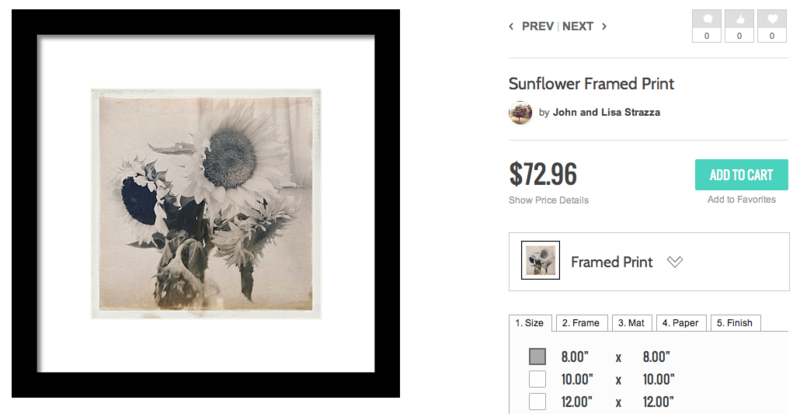 Here is a screen shot of the mobile prints site.